If you ever felt like speeding pass a traffic camera, maybe you'll want to know a bit more about what some of those radar camera systems can really see. Just like every other piece of technology, vision and camera systems have evolved over the past years, and are now more than capable of tracking multiple vehicles across several lanes... all at once. 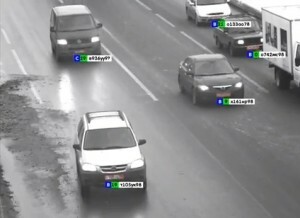 This CORDON multi-target radar system, for example, can track up to 32 cars in 4 lanes - with each car being correctly identified by its license plate, and having its speed overlaid on the image (green for traveling under the speed limit, yellow near the limit, and red if speeding. ).